There is something special about each of our church buildings. One of the special somethings about our Union Street church is the stained glass. These windows of primarily saints surround us in our worship and remind us we are never alone. Did you know that Joan of Arc had visions from saints that were in the windows of her childhood church? She is located in the front of the church along with St. Helena and St. Agnes. 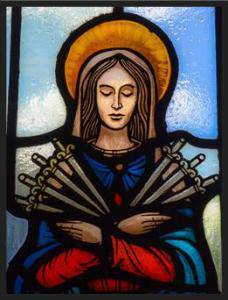 She is Mary holding seven swords because she had seven sorrows. Simeon had prophesied that, “Behold, this Child is appointed for the fall and rise of many in Israel, and for a sign to be opposed— and a sword will pierce even your own soul—to the end that thoughts from many hearts may be revealed,” (Luke 2: 34-35). I’ve been captured by this window all year, because she holds the swords so tightly to herself. I tend to hold my sorrows tightly too. I know I need to hold them out to the Lord so we can bear them together, but I forget and think I can somehow handle them on my own (never works). Because Mary often pondered things in her heart, I wonder if she struggled with holding out her sorrows too. I mean, she’s Mary so probably not – but in my imagination, I like to think she knows what I’m talking about at least. So I’m staring at this window and feeling solidarity with Our Lady of Sorrows, when the lights on the Christmas tree up there turned on! I think they are set on a timer so they will be on for daily Mass. The timing was impeccable. It completely turned my thinking. Here was Mary holding tightly to her sorrows, and light came in to shine on her. This soft, gentle light was like a reminder that she (me, all of us) doesn’t have to stay in the dark with her worries. God shines God’s light in all the dark places where fear tends to creep in. The love of this light dispels fear. The sorrows may remain, but the light accompanies. “The light shines in the darkness, and the darkness has not overcome it,” (John 1: 5). So I share this with you, the church, because I would LOVE to hear if these windows, our saints of Union Street, have ever caused reflection for you. We would love to be enriched by your stories!